The Flash Center™ Software is a software package that allows engineers to quickly erase, program, and verify I2C- and SPI-based EEPROM and Flash memory chips that are interfaced through Total Phase's Promira™ Serial Platform, Aardvark™ I2C/SPI Host Adapter, and Cheetah™ SPI Host Adapter. Detailed technical information about the Flash Center Software can be found in the User Manual. 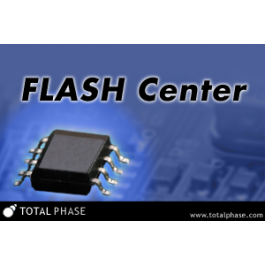 The Flash Center Software takes advantage of Total Phase's high performance host adapters to maximize programming speed. Unlike other programmers which can take minutes to program a memory device, the Flash Center Software can program the same device in seconds. There are no images to download to an external programmer - the bytes are sent directly into your target device from the host computer. Since the Cheetah SPI Host Adapter is capable of signaling at over 40 MHz, the main speed limitation is the flash memory's page commit time. The Cheetah adapter is able to erase, program, and verify a typical 1 Megabyte flash memory in only 23 seconds. Gang programming is easy with the Flash Center Software. By connecting multiple Aardvark I2C/SPI and/or Cheetah SPI Host Adapter to your computer, you can use any or all of the devices to program your target devices in parallel. Users do not need to wait for the next release to have support for their memory chips to be added to the Flash Center Software. The Flash Center Software was designed with an XML-based memory device library. By adding or modifying the XML descriptions of target memory devices, developers can instantly support almost any I2C- or SPI-based EEPROM or Flash memory. The Flash Center supports the use of multiple host adapters in parallel. It can use any number of Aardvark I2C/SPI and Cheetah SPI Host Adapter at one time. The Flash Center supports a large number of memory devices and the library can be expanding by loading new XML-based part descriptor files. This is a list of the I2C and SPI memories in the Flash Center Software built-in library. If you don't see your memory part on this list, our software allows users to add memory devices to the parts library. Details on how to add additional memory devices can be found in the Flash Center Software User Manual under Section 4. If you have any further questions, please contact sales@totalphase.com. The software is officially supported on 32-bit and 64-bit distributions of Windows XP (SP2 or later), Windows Vista, Windows 7, and Windows 8/8.1. The software has been designed for Red Hat Enterprise Linux 4 and 5 with kernel 2.6. Customers have reported successful operation with SuSE, Ubuntu, Fedora, Arch, CentOS and Debian distributions. Please be aware that there may be significant differences and idiosyncrasies in the way that different distributions of Linux operate. As such, Total Phase may not be able to support your particular distribution of Linux. Support will be offered on a case-by-case basis. The latest firmware for the Aardvark I2C/SPI Host Adapter and Cheetah SPI Host Adaptor can be downloaded from the Downloads section of the website. 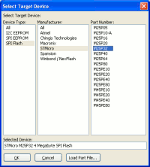 How Do I Define Erase Values in an SPI Flash Device XML File for the Flash Center Software? What Are the Best Tools for Programming 1.8v and 3.3v SPI Devices when Using a Flash Socket Board? What is the Easiest Way to Test and Program new Quad SPI Flash Devices? What is the Easiest Way to Program and Verify a New SPI Memory Chip in Duo-Quad SPI Modes? How Do I Modify XML Files to Use the Cheetah SPI Host Adapter with the Flash Center Software to Continue Production Runs with a New Flash Device? Should I Use the Flash Center Software or the Aardvark API with the Aardvark I2C/SPI Host Adapter to Program the Pages of an I2C EEPROM?